On Saturday September 8, 2012 a female jouster made history. 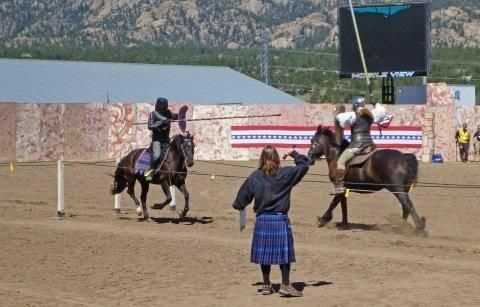 Kryssi is the first female jouster to place first in the Light Armour Jousting Competition in Estes Park Highland Games. Light Armour jousting is the first jousting style of the medieval times. It predates the full armour featured on “The Knights of Mayhem” and “Full Metal Jousting” tv shows recently aired on National Geographic and the History Channel respectively. It requires three important skills: horsemanship, accuracy with a lance and presenting a shield for target. Two teams competed for the title of best in Medieval Games, Light Armour and Heavy Armour. In the first round Kryssi won 9 to 8 vs Allison Mazurkiewicz. 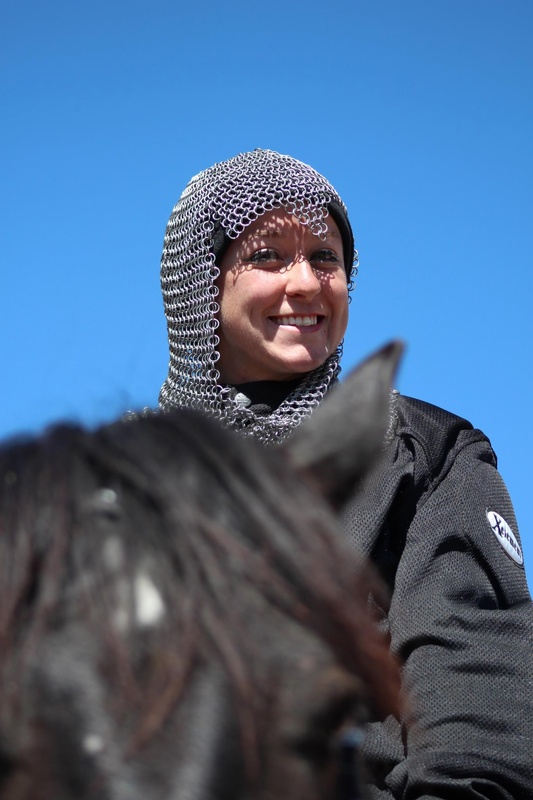 Allison is also a member of Knights Edge Jousting Academy founded by Patrick Lambke, “The Black Knight”. The second round Kryssi lost 8 to 10 vs Rob Combe. Rob Combe is a veteran Canadian Jouster with Knights of Valour founded by Shane Adams. Kryssi was the highest point non-winner from the second round, therefore, she was given the chance to joust in the third round. She won 7 to 2 vs Zak Lovening (Knights of Valour) to challenge Rob Combe to a grudge match for first place. The tension in the stadium turned into a foot stomping celebration as Krissi won in a close 8 to 7 match vs Rob Combe. Saturday First Round Scores: Shane (11) vs Rich Laubhan (6); Tyler Kekolay (6) vs Jeremy Johnson (4); Rob Combe (8) vs Ken Burton (5); Kryssi (9) vs Allison (8) and Zak Lovering (4) vs Lauren Sturges (2). Saturday Fourth Round Scores: Shane (8) wins third place vs Zak (6) wins fourth place. Kryssi (8) for first place vs Rob (7) for second place. Sunday First round scores: Shane Adams(16) vs Zak Lovering (10); Rich Laubhan (9) vs Allison Mazurkeiwicz (6); Ken Burton (14) vs Jeremy Johnson (8); Rob Combe (10) vs Lauren Sturges (0); and Tyler Kekolay (10) vs Kryssi Jeaux Miller (4). In the second round Shane won 13 to 10 defeating Rich. Rich was the second round non-winner high score and went on to joust Zak Lovering and lost 7 to 2. Shane jousted Rob Combe and won 8 to 6. Shane moves on to joust for first or second place. Rich jousted Rob Combe in the third round (3rd and 4th place) and Rob was victorious 9 to 3. Shane and Zak battled for first and second place with Shane defeating Zak by one point 6 to 5 to end the Light Armour competition for the weekend. The Heavy Armour competition was held as the jousting grand finale. congrats to Krissi, it was a beautiful day for a win. our whole family enjoyed watching a female win. for us, the jousting is the highlight of the festival.